EXCITING developments are afoot on the Midland Met Hospital construction site, as the big cranes that have been such a feature of the skyline for many months, have completed their work and are ready to move on. This is a great moment in the build as it means the heavy lifting has been done with the huge steels in place, the roof is on and the building watertight. 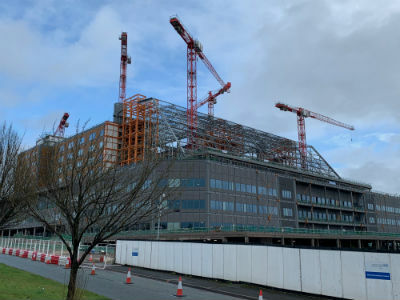 Toby Lewis, Chief Executive of Sandwell and West Birmingham NHS Trust which will run the new hospital, commented: “Since October 2018 work has been underway on site to make good the two thirds built hospital, following the pause in construction which occurred after Carillion’s collapse. We are pleased that our interim contractor Balfour Beatty has made good progress, and our building is secure against bad weather, and is safe and dry. “This coming summer we will announce our new contractor who will take the build forward to completion in 2022, and whilst that is happening we will be looking at how we manage our acute services in the interim until we move to our new acute home. “However The Midland Met is only the part of our story covering emergency and acute care, as we are making substantial investments in our current sites, parts of which we will retain following our move, to provide outpatient, community and day surgery services from City, Sandwell and Rowley Regis Hospitals.